Our trip to Madagascar went fine, except for the fact that our luggage got stuck in Johannesburg. The visa was easy to get, just fill in a form and pay 13 euro. At the airport we were immediately approached by the friendly although little pushy Malagasy. But repeating a few times “une moment s`il vous plait” (Madagascar used to be a French colony), gave us a few moments of peace. In Madagascar the only way to get money out of an ATM is to use your VISA card, luckily Edvar has one so this did not cause us any problems. After getting some cash we talked to Jimmy, one of the local guides. In every town you will be approached by one of the local guides, who will try to persuade you to book a tour with him. He knew a nice hotel and helped us catch a cab for 40000 Ariary (about 16 euro). Sunday we contacted the airport to find out if our luggage had arrived and indeed it did. Only the customs would be closed on Sunday, so we would not be able to retrieve it before Monday. We called Jimmy to inform him we did not need transportation to the airport. He happened to be in the area and was sure that customs would be there when one of the flights would come in. We took our chances and went to the airport and were able to retrieve our luggage back on Sunday. Jimmy wanted to arrange our entire trip in Madagascar, but we decided to arrange things on our own, because we did not want to plan that far ahead and his proposal was way too expensive. The tourists white skin causes prices to go up at least twice as much (often even more), so bargaining is a must, but we are getting the hang of that. For example: Our cab arranged by Jimmy to the airport was only 15000 Ariary instead of 40000 Ariary, just to show the difference. But since we liked Jimmy we let him arrange our tour to Parc d’Andasibe - Mantadia. First we visited Mandrake Park, a park where we had our first encounter with two lemur species (the coquerel’s sifaka and the red fronted brown lemur), regretfully the animals are fed by hand. The lemurs in Madagascar are only protected in the national parks and their natural environment is destroyed by logging of the forests and mining. 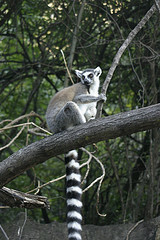 In Parc d’Andasibe you can therefore also view lemurs that did not originally live here but were introduced. In park Mandrake it is also possible to see other animals, like crocodiles, chameleons, geckos, frogs, snakes, butterflies, bats and centipedes. Some of these animals are difficult to spot in the wild, although of course it is more like a zoo. Walking in the rainforest with our guides John and Richard was a nice experience. They were able to spot a lot and gave nice information about the local animals and plants in English. We were able to watch different species of lemur, like the indri, the diademed sifaka, the common brown lemur, the grey bamboo lemur, the black and white ruffed lemur and the eastern woolly lemur. We also saw many birds (like couas, sunbirds, trogons and a madagascar cuckoohawk), different species of chameleon, and two large groups of young centipedes and a few geckos. Another inhabitant of the park gets active after the rain, which made me an unvoluntairy blooddonor for four leeches. These nice animals can cause infections, which I prevented by sterilisation with perfume, but luckily their bite is not painful . Our driver Franky drove us safely in his from Holland imported Peugeot from and back to Tana, although we felt a little bit nauseous from the fumes. Edvar figured you can make a fortune selling carbon filters in Madagascar . The driving attitude of most Malagasy is taking over slowly, even when you can’t see much ahead, as the approaching vehicles will have brakes too. In the city the wise guys get to go first … Pedestrians can wait forever, or just wave their hands and start crossing the road . Our first impression of Madagascar is that the people are very friendly, real negotiators, bargaining is essential, make sure your first counter offer is lower that what you’re willing to pay. No hard workers, when paid they tend to stop working, so when you want them to continue doing their best, pay the last part after the job is done. Big differences between rich and poor, people with brand new Jeeps and modern clothing, opposite begging street children. However it seems that people are taking care of each other, as most street children seem quite healthy and happy. Persistent, almost intimidating by approaching tourists in large groups, hoping to sell something. An example: If you are approaching the taxi-brousse station, dozens of Malagasy will try to figure out where you’re heading and will try to persuade you to get into their own taxi-brousse, doing so by hanging half way into your deux-cheveaux taxi. 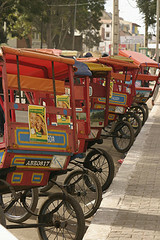 A taxi-brousse is a kind of taxi van driving between the larger towns. Good strategy: Say “mora mora” (”easy easy” in Malagasy) and ignore them, until you get out got your backpack ready and ask for the list with normal fares. After you agreed upon the price, another 2000 Ariary will be added for the luggage and they will try to get a tip for putting your luggage on top of the van. Our first taxi-brousse trip from Tana to Antsirabe in the end costed us 10000 Ariary p.p. (8000 + 2000 for the luggage, no tip). Edvar noticed the price of 7000 Ariary in the ticketbooklet so we probably would have been able to arrange it even cheaper. Travelling by taxi-brousse was good enough for us, it took us three and a half hours including the lunchbreak and toiletbreak. The ”attack”-strategy was also performed on arrival in Antsirabe by the Pousse-Pousse runners (a kind of run-riksja), again stay calm and bargaining is the best strategy, agree upon a price including the luggage. The Malagasy are passionate people, which we experienced during one of our diners in Antananarivo, where during a fight glasses were flying around. The food is simple and in smaller amounts compared to Brazil, but good enough. Hotels are simple, but with a warm shower and clean. The next days we will be heading South (Tulear). For the pictures you just have to be patient until we will be able to find a quicker connection. In search of lemurs and finally sun, ocean, beach! Back in Antanarivo we have a day left to write you an internet update, before we leave on our flight tomorrow to Tanzania. The silence from our side was due to the slow internetconnections here in Madagascar. Since our last update we took the taxibrousse south towards Antsirabe, Fianarantsoa, Ranohira and eventually past Ilakaka on our way to Tulear, to take a boat to our beach destination in Anakao. Antsirabe is a nice town, although the nights were very cold in the nice hotel with a beautiful garden (Green Park Hotel). We strawled around, but did not really do much else. In Fianarantsoa we spend quite some time before and after our visit to National Parc Ranomafana. National Park Ranomafana is just as the other park we visited tropical rainforest, but with more hills. During the nightsafari the animals were made visible by supplying food. Just put some bananajelly on a tree and the mouselemurs do not mind to come out and lick it off, just as the striped civetcat will show its face if you supply it with some food. Our daytrip was nice although our guide Rudy was sometimes hard to keep up with. Due to the rough path and the hills it was not easy to look around while you were walking, especially since the rain made everyting quite slippery. Again spotted some lemurs: golden bamboo lemur, greater bamboo lemur, woolly lemur, redbellied common brown lemur and the single tooth sportive lemur. The latter being nocturnal was being disturbed every day by the guides by rattling the liana that went just by its hole in the tree. If I were him/her I would definetly move. We decided to go straightback to Fianarantsoa from the parc, which was quite easy since in no time we were able to catch a taxibrousse with two empty seats, so we were lucky. The evening before Independence Day was celebrated with fireworks and children walking down the streets of Fianarantsoa with nice little lanterns with real candles, so cute. There were also all kinds of festivities on Independence Day (26 June) itself, but most of it we mist since we were sleeping late. Pierrette was the lady who recommended us the hotel in Fianarantsoa and she invited us at her own home. Although she said we were the first tourists to visit her sick mom, we had a little mixed feelings with the visit. Checking out of the hotel we gave her a small token of our appreciation. 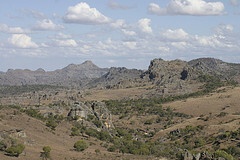 From Fianarantsoa we headed towards Ranohira, to the National Parc d’Isalo. Visited the Canyon des Makis and walked back to Ranohira through the Canyon, very impressive. Edvar was not really feeling well after a cup of tea with a strange taste and started vomiting multiple times during our walk and visiting the toilet did not bring a normal stool but diarrhea like water. My brave man, although with a slightly slower motion, ended our walk anyway. Luckily we were able to arrange transportation for him for the last six kilometers. A friendly group of people from Indian ancestors born in Madagascar and now living in Londen made this possible, very nice of them. Together with our guide Roxy I walked the final six kilometers. Again we were able to spot some lemurs: ringtailed lemur, redfronted common brown lemur and the vasseux sifaka. The next day we took a local cab towards Ilakaka where we took the taxibrousse towards Tulear. Unluckily our taxibrousse broke down twenty kilometers from Tulear. I believe there was a hole in the tank and a defect gasolinepump, which caused the engine to stall everytime. By hand pump up some gasoline and the men giving the car a push and it would be running for a kilometer or so, this ritual was repeated multiple times. Eventually some kind of construction was made with our empty bottle of water used as gasoline reservoir and some gasoline was bought from another passing taxibrousse. In the end we managed to reach a gasstation, where the tank was refilled and with a final push we were able to reach Tulear safely two hours later than planned. Taxibroussing is quite an experience at itself: vomiting children, alive ducks between your legs packed in a plastic bag, sleeping children on your lap and occasionally the car breaks down. But this is a way to get in contact with the real local Malagassy people and even though communication is sometimes difficult, you can enjoy your time especially when the car breaks down. Thumbing with your fingers for good luck (sort of keeping your fingers crossed) is one of the things we taught them, hoping the taxibrousse would last a little bit longer than just the two kilometers before the engine would stall again, not that it really helped . If you have something to eat beware, since the people are not really modest. A lady had a nasty cough so I offered her some mint candy for her throat. One of the other ladies more or less demanded she wanted a bonbon aswell. Which made me share my mint candy with everyone, some really appreciated the gesture. The Pringles I shared during our breakdown adventure were faster gone than I could blink with my eyes. Although one of the guys shared a piece of bread with me and I offered him to take some of my Tuccies. Tulear is not really our town, it just misses the ambiance and they take siesta, which makes shops to open past half past three in the afternoon. 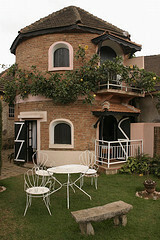 You can have nice meals at Le Maison and at Estrelle. After a lot of effort we were finally able to get some tampons (at some kind of wholesaler), maybe expensive for Malagassy prices, but comparable to Dutch prices. We had a hard time trying to explain what we wanted in French, but we found out we just had to ask for Tampax or O.B. in the first shop we tried. To Anakao we took the boat over a mirrorflat ocean. After shopping around we ended up at Lalakaka, friendly people and the delicious food is included. Great view from our cabin looking at the ocean, white sandy beaches, great weather, and yes we were finally able to put on some teint, although we had to be careful not to be lobstered alive. Our cabin obviously was not locked good enough, since on our second day someone was able to enter it through one of the windows and went through our bags. At first we thought nothing was taken, but an amount of 70.000 Ariari (28 euro) was missing. Bummer, but luckily we still had the rest of our money and did not have to cut our visit to Anakao short due to lack of money. On Anakao no ATM is available and you cannot pay electonically, so tourist wander around with large amounts of money, easy targets for thieves in need of money. After our discovery we made sure to pay for the four nights on Anakao in advance so at least that part of our money would not be available for stealing anymore. Our windows were barricaded shut by the personel, what of course was a little too late, but a friendly gesture. After two pills of loperamide and ORS Edvar luckily got rid of his diarrhea, but he had lost a few kilos of bodyweight. So now I order him to eat a lot to get those kilos back on. 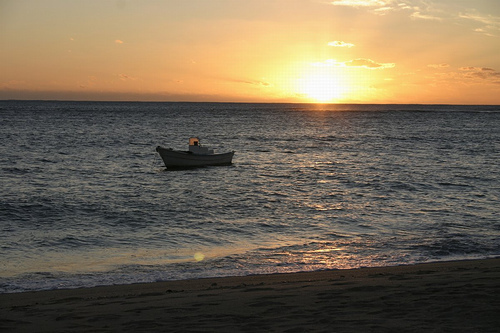 We really enjoyed our time at Anakoa it is like a little piece of paradise on earth, with marvelous sunsets. Our boattrip back to Tulear was a bumpy ride, because the boat hit the waves with quite some forse, but except from the shower with salty seawater we survived. After trying to get a ride back to Antanarivo at the postoffice, which happened to be completely booked for the next day, we decided to catch a local flight back to Antanarivo. I am very happy we did, since otherwise we would not have been able to write this update and I would have my period and added to that diarrhea (yep obviously I am next), sitting in a taxibrousse for twentyfour hours, which was not really something I was looking forward too. Tomorrow we will be flying to Johannesburg where we will spent the night in a transfer hotel. The next day we will be heading by plane towards Dar Es Salaam in Tanzania. And if the lonely planet is right, this will be another primitive country or we will be broke leaving Tanzania . Don’t forget to take a look at the Photo Gallery, where you can find 116 pictures of Madagascar, plus a few last pics of Brazil. Enjoy! The flight to Johannesburg was delayed for several hours, but thanks to our Malagasy attitude of “mora mora”, we kept smiling. In Johannesburg, we first wanted to stay at the transit hotel, but $140 was a bit too expensive for us. So, we passed customs, went to an information desk and asked for some cheap accommondation. We ended up at a very nice guesthouse, just six kilometers from the airport. The next day we flew from Johannesburg to Dar Es Salaam in Tanzania. The visa was not a problem at all: fill in some forms, spend two hours in the waiting line and pay $50 per person. When this was finished, we took a cab to the center, looked at some of the hotels and finally found a nice place for $20 per night. As we are travelling next month to India, we went to the Indian Embassy on Tuesday to arrange our visa. Again, filling in some forms, adding a photo of our faces and paying $65 per person. It takes them four days to arrange it for us, so if everything goes turnes out fine, we will have our passports back later this afternoon, including the visa. When we walked back from a restaurant to our hotel later that day, on a busy and well-lit road, we suddenly became the victims of two pickpocketers . It ended without any serious outcome: the only thing they could easily steal was our Lonely Planet, but they didn’t succeed as it was stuck in my pocket and as they didn’t expect our quick and intense reaction. The pickpockets run away quite quickly . Finally I am allowed to announce our little secret! No, don’t worry I am not pregnant, I have taken my birthcontrol pills according to plan. People who know me well, know that I am very capable of keeping secrets for other people, but have a lot more difficulty with keeping secrets that concern myself. Madagascar 3rd of July 2007, during a marvelous sunset at the beach of Anakao, Edvar proposed to me and of course I said yes, I would love to marry him! We wanted to inform everyone, when we were certain of the date, but due to the bureaucracy, we are still not sure of the date. We would like to marry on the 4th July 2008 (preliminary date), so put this date in your agenda so you make sure you are not occupied! Even though according to the website of the Deventer municipality you can just give them a call to reserve a wedding date, you have to fill in some form. After waiting for a response for a week, we received an email back, that we should fill in the form, which we should do as soon as possible as we would be back in the Netherlands in October, with the possibility that the date would be gone. Again we sent an email if it would be possible to sent us the form electronically, because of our trip around the world, but we have not received an answer yet. I know I can be rather impatient , so we decided to call the people we wanted to tell personally anyway, although we don’t have a final date yet. Of course our mobile phone has decided not to work in Tanzania grrr, so we tried to make the international calls from an internetcafe with a very bad connection and we were not able to reach everyone. So in desperation we decided to send a lot of sms’s and luckily we were able to reach almost everyone or better said they reached us . At the time you read this, we have managed to reach almost everyone and will have put this message on our website and the whole world is allowed to know!!!!! Shaken not stirred turning black and blue in a landrover on Safari hunting for the Big Five! First of all we want to thank everyone for all nice reactions and congratulations we received as a reaction to our planned wedding on the 4th of July 2008. The date has now officially been set, since the nice man at the Deventer municipality decided he could reserve the date without the official form after my second email. We really enjoyed reading all the reactions yesterday, since we were in the middle of nowhere on Safari the last six days. If you like animals going on Safari is really a great experience, which I can recommend to anyone. Most people were wise enough to take their seats when the landrover was on the move, but Edvar and I were standing on our seats with our noses in the wind for six days trying to spot the animals. The downside of this is that the terrain can be quite rough and you get shaken around and turn blue everywhere you and the car encounter each other. We started in Lake Manyara National Park, after that a day in the Serengeti, a day Ngorongoro Crater, a day Tarangire National Park and finished with a day in Arusha National Park. Each park has its charmes and its difficult to decide which park has our preference. Lake Manyara National Park is small, very green with lots of animals, which made us able to spot four of the animals of the Big Five on our first day (Buffalo, Elephant, Leopard and Lion), only the Rhino was able to avoid an encounter with us during our six day Safari. The Serengeti is very cool because of its dry nature and large plains filled with Thompson Gazelles and the large herds of Zebras and Wildebeest. The Serengeti should be very impressive in February, because all the young Wildebeests are born on the large plains at that time. The Ngorongoro Crater differs from green pastures to lakes and large plains. Tarangire National Park has nice hills, with a nice river, which attracts a lot of animals and large herds of elephants. Arusha National Park has a lot of lakes is small, but the Colobus Monkeys are very impressive, a nice waterfall and a river. Besides you can take a walking safari and it is really amazing standing in front of a Giraffe only a few meters away, the perspective is really different than from the car. The third day when we came back tired from a long day Safari sitting in our tent Edvar wanted to make a backup from his memorycard, unluckily he pressed the wrong button and formatted the pictures of the last two days. Of course this was a real shame, so now he is trying to get them back one way or another. I hope he will succeed since I believe there are some really nice pictures on there. Lions look just like normal housecats, lying lazy on their backs alongside the road, not really impressive. Although in action they are quite impressive, especially when a large herd of Zebras panics when there is a Lion in the area. Even I got quite startled from a female Lion who gazed at me hearing the sound of the camera when I was taking a number of pictures from her. I quickly duck down in the landrover, since I really had the feeling she was considering me for her next lunch. The Cheetah we spotted was also relaxing on a sanddune probably digesting its last meal. We also saw a hyena, who caught a rabbit or something leaving behind the carcass, so two Jackals decided they would run away with the scraps. The hyena changed its mind and tried to catch the Jackal, but did not succeed and in the end gave up. Going to the toilet at night is an adventure by itself. Not every campsite has fences and the animals tend to walk through the campsites at night. Since I am completely blind without my contacts, I did not really feel completely comfortable when I heard something behind me and I was thinking a Lion might confuse me for a Zebra in my black and white pajamas. Safaris are really ridiculously expensive. We paid 830 dollars per person for six days Safari, this was already with a big discount, since we booked the tour together with two Danish people, Torben and Mette. The Safari was based on adventure camping, so every night with your sleeping bag in a small dome tent. We booked our tour at Victoria Expeditions, we were satisfied with our friendly cook Florian, but our driver/guide Robert was a very blunt person. The first four days we hardly knew what the day planning would be and there was not much said about the parks or the animals. We had the feeling we only had a driver not a guide. The Danish people only booked for four days and left without tipping, which came as quite a surprise according to our guide. So I kindly explained to him why we thought he did not deserve a tip and he had two days to improve himself. After this little chat he tried a little harder, but I believe he does not really enjoy his job, although in the last two days we found out he knew a lot about the animals. 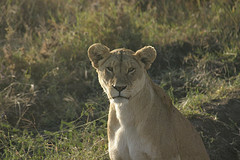 The surroundings and the animals are so amazing that all this did not really spoil our fun. Back in Arusha our promised night at the Meru House Inn was not arranged and we were put in a different hotel without any apology for the inconvenience. They would pick us up the next morning, but after half an hour waiting we decided that we would not spend another dime at the Meru House Inn or Victoria Expeditions. Fourty five minutes too late a car stopped at the side of the road to pick us up when we were walking towards the centre of town, but we told them we would find another place to stay. At the city centre we booked a local flight to Zanzibar in the afternoon, since we did not really feel like staying in Arusha anymore. Today we booked a diving trip for Wednesday and bought the lonely planet of India, so we can start preparing for our next country and are now trying to get you guys up to date of our last adventures and hopefully save the lost pictures. The pictures have been saved! Relaxing and diving on Zanzibar! Luckily Edvar succeeded in restoring the formatted pictures from the memorycard with software he could download from the internet (”Don’t Panic” from ImageRecall, for 25 UK Pounds). So we are able to enjoy our pictures after all and so can you, see the Photo Gallery!! 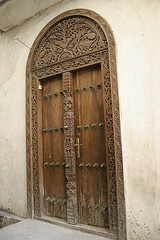 Meanwhile we are just relaxing in Stone Town on Zanzibar. A nice little town on the coast with clear blue water, with nice little allies and wonderful doors made from carved wood. Yesterday we went diving for the first time together and just as above the surface we are real soulmates below the surface, so Edvar can be my buddy anytime! We had lunch on a beautiful sandbank with white sand and beautiful shells which unluckily we are not allowed to take with us. For the days to come we will just stay in Stone Town, maybe head for a beach in the area and tomorrow try to catch the local transportation (the dalla-dalla) for a day trip to Jozani Forest. Tuesday we will take the ferry to Dar Es Salaam, where we will spend one night before we will catch our plane to Johannesburg and our last flight towards Mumbai in India.